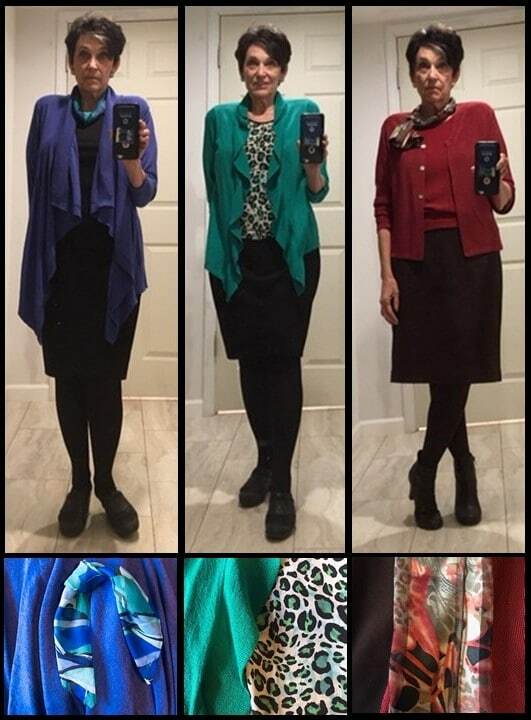 Still going strong with my goal of a new outfit each day using garments and accessories I already own. It’s so much fun to have something new to wear without spending a dime. And I’m rediscovering old favorites that I’d been overlooking just because of sheer laziness. Here are nine more combinations and the lessons I’m learning from this exercise. Day included meetings in room that I know to be chilly, so this twin set paired with brown ponte skirt was ideal. The pashmina is featherweight, so I could wear it as a scarf (shown) or slip it off and use it as a wrap if I got too cool. Errands and coffee with girlfriends – black jeans and tank with blush cardigan (Cabi). Scarf adds polish and connects the color. That blush is a magic color for nearly all Caucasian women because it relates so well to skin tones. Those with higher-contrast coloring like mine would have a hard time wearing blush head-to-toe, but mixed with a darker color it gives just the right amount of contrast. I hated jeans for my entire life – went decades without even owning a pair – but now that they have comfort stretch and softness I’m a total convert. Speaking of comfort – this outfit is really gym-wear, but the print and fun color make it cute enough to wear for a mostly at-home day plus a post office run to ship fabric orders. The top is a cotton sweater I found at the Resale Shop Couturier Sale (I wrote about that a while back) and the neckline is like a built-in infinity scarf. It is fast becoming a favorite. It’s the same one I wore with the short plaid skirt in week 1. For the next 3 days I was taking a comprehensive communications training course. Pre-course materials said business casual, but considering it a work function I up-scaled just a bit from that expectation. First day was a simple black column – skirt and tank – topped with a blue cascade sweater and bright little scarf. This photo really makes me appreciate the value of a color column to elongate my figure — and the added verticals formed by the cascade of the sweater don’t hurt either. The print top set the color scheme for this outfit – same black pencil skirt as yesterday topped with a coordinating green sweater. So many women tell me they can’t wear green, but there are green shades that flatter anyone’s coloring. Just not the same green for everyone. No need for a linking accessory when the combo includes a print garment. Just a basic statement earring and this one was complete. Last day of class – chocolate pencil skirt and this off-red sweater from the ReSale Shop (I wrote more about this sweater HERE). Most people would never think of pairing brown and red, but the link makes it work like a charm. Wearing matching over and under sweaters down disrupt that column of color, but by blousing the under-sweater so it is shorter than the cardigan, I at least avoid a widening horizontal at the hipline. And the scarf pulls attention away from that area anyway. The photo it reminds me to go in and taper the skirt a bit so the hemline makes a less dominant horizontal too. Another all-day class – this one a goal-setting event my girlfriend Karen runs every year. (Mr. Wonderful says I caught him and asks what other goal even matters?) 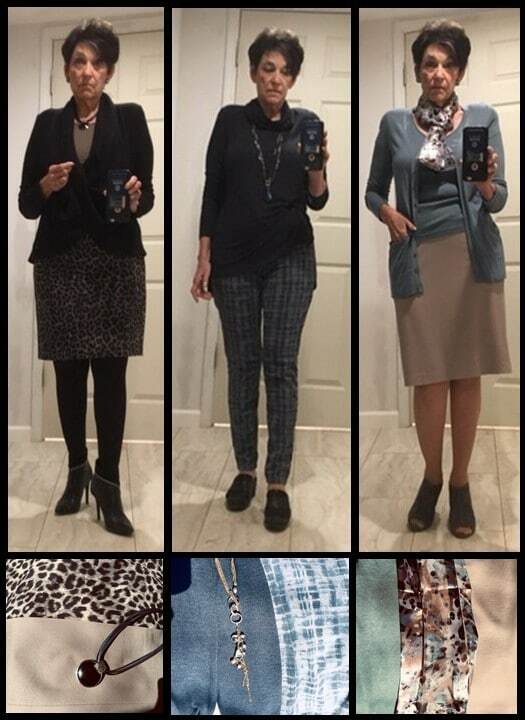 I love the ongoing trend of skin prints, but can’t wear the warm brown/caramel/camel mix, so I was excited to find this black/gray/taupe one a couple of years ago. Old taupe tank (at least 10 years, maybe more) and that black infinity sweater (again!) accented with an antiqued silver necklace (the dark detail in the silver relates to the light/dark of the print). This is another vintage item in my jewelry collection – from the era when my kids were in high school, so that makes it about 15 years. Like scarves, fashion jewelry is n inexpensive investment with a long, long life in your wardrobe. Is it time to weed out and polish up your own collection? Or start building a collection in the first place? Kick-around day, plus Chinese restaurant dinner with my 96-year-old father-in-law – a long-standing tradition. The plaid jeans are a repeat, this time paired with an ultra-soft tunic. The top felt a little long, so I tucked one side partially into the waistband for a draped effect. This necklace is another one from the kids’ high school days. I was a personal shopper for Lord & Taylor back then, making m own shopping almost automatic. A surprisingly warm January day put me in the mood for a lighter-color look, and this pale blue sweater plus pale taupe skirt felt just right. I struggled with show choice – black seemed way to heavy but creamy choices felt too summery. Final choice: lighter gray open-toe booties that relate to colors in the scarf and also to my everyday tote. This combo taught me 2 lessons. 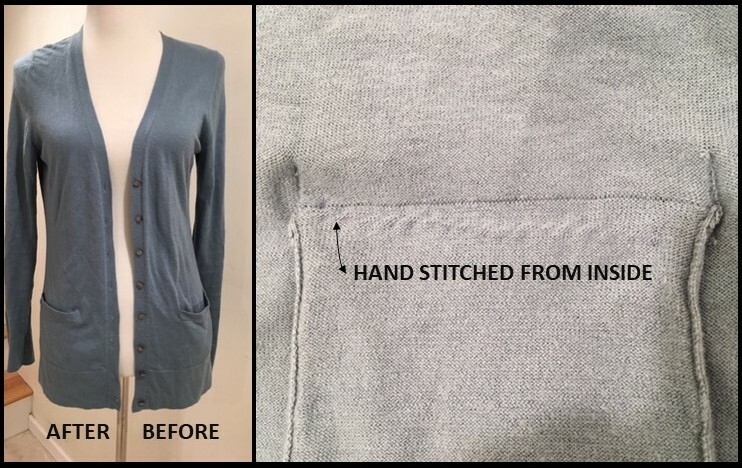 First, the sagging pockets made me crazy (see easy fix below) and second, my hormone-enhanced bustline was never again going to fit this cardigan. It now looks great on my daughter. Oh well … I obviously have plenty of other options in my closet. I’d love to see outfits you find when YOU shop in your closet. You can post them on my Facebook page. So helpful! I love your combinations! 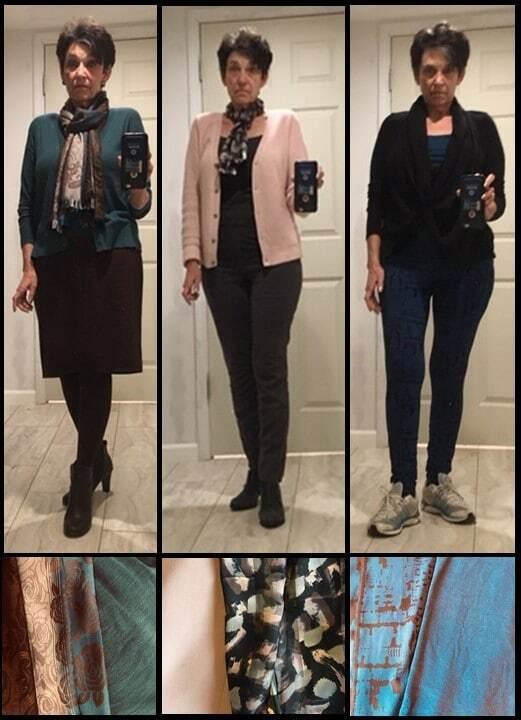 Thanks Jennie – I’d love to see the outfits you put together based on this challenge. I have a sweater with droopy pockets. I’ve tried a number of options to get them to hang right. Your solution looks like an answer, but it looks like the pockets ate sewn closed. Am I correct? If they are not stitched closed, what is the procedure? Thanks for your ongoing tips; I read every one and they keep me inspired. They are indeed stitched shut; there is just no way for the weight of a pocket not to pull down on a soft sweater knit. We love pockets as a place to put “stuff”, but when we use them, it makes the droopy thing even worse. Bummer, huh? I have started shopping my closet and am surprised with what I find. It is time to “love it or toss it” and reorganize my closet by color. Glad you’ve had some ah-has from the process. I had one this morning when I realized how much wear I get from a long navy cardigan. The one I have is casual and strictly cold-weather wear, so I just ordered a slightly dressier one in a spring weight for warmer days ahead. Please hp over to the FB page – Nancy Nix-Rice Wardrobe Consulting, LIKE the page and post some pics of your outfits for others to be inspired by.